The five permanent members of the United Nations Security Council were struggling to agree on a draft resolution endorsing an international bid to end the five-year-old civil war in Syria ahead of ministerial talks taking place in New York on Friday. The U.S. ambassador to the United Nations, Samantha Power, told reporters that the five veto-wielding council members did not yet have an agreed draft to present to the 15-nation body for approval on Friday. Originally, Western powers hoped the council would rubber-stamp a resolution endorsing a two-year road map for talks between Syria’s government and opposition on a unity government expected to begin in January and eventual elections. Council diplomats said they hoped agreement on a text could be clinched. The road map, which also calls for a nationwide ceasefire that would not apply to Islamic State, Nusra Front and some other militant groups, was worked out in two rounds of ministerial talks in Vienna. Russian Ambassador Vitaly Churkin suggested there were significant disagreements among the five powers. “I’m not sure it’s going to happen because there are some unfortunately deliberate, or not deliberate, attempts to undercut the Vienna documents and we don’t want to see that,” he told reporters without elaborating. German Foreign Minister Frank-Walter Steinmeier said there was “some movement” in the talks on Syria, adding that one goal of the New York meetings was to clarify the timeline for peace talks between the government and opposition. 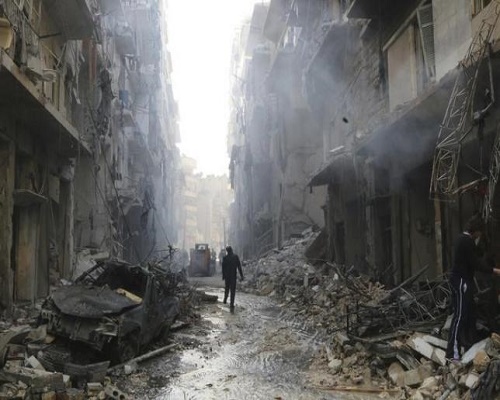 Foreign ministers from more than a dozen countries – including Russia, the United States, Turkey, Saudi Arabia, Iran and other European and Middle Eastern powers – were set for talks aimed at ending Syria’s old civil war at New York’s Palace Hotel on Friday. Diplomats said no breakthrough was expected. Earlier this week diplomats said some progress had been made on the most difficult sticking point in the talks – the fate of Syrian President Bashar al-Assad. They said Russia had indicated it had no problem with the eventual ouster of Assad at the end of a transition period, though it would not admit that publicly. Despite the narrowing of differences, disagreements remain, as shown by the difficulties the five permanent council members were having agreeing on a resolution endorsing the Vienna road map. Issues to be discussed at Friday’s meeting include a mechanism for monitoring of any future ceasefire and a lineup for an opposition delegation to negotiate with Assad’s government. Western officials say a recent meeting in Saudi Arabia of opposition figures made significant headway in coming up with an opposition bloc.